Texas A&M Aggies volleyball match against the University of Texas Longhorns at Gregory Gym in Austin, Texas on April 4, 2018. Texas pulled away for a 25-15, 18-25, 25-16, 25-23 win over Texas A&M in an exhibition match tonight at Gregory Gymnasium. Aggie outside hitter Hollann Hans led all players with 15 kills as well as six service aces, which would tie the school record had it been an official match. 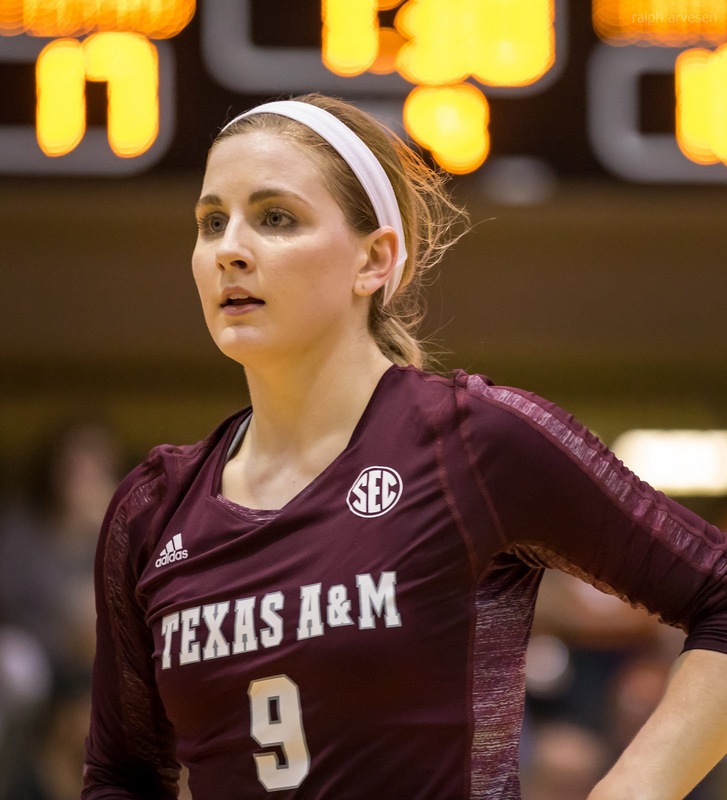 A&M libero Amy Houser tied for match-high honors in digs with 16. The Longhorns jumped out to a 5-1 lead in the opening set, but A&M fought back and took a 7-6 lead on an ace by defensive specialist Haley Slocum. A&M later committed back-to-back hitting errors to return the lead to Texas, 9-8. The Longhorns, who outhit A&M, .381 to -.077 in the set, continued to pull away, outscoring the Aggies, 8-1, to close out the frame. Texas built a 17-10 lead in the second set before a service error sent Hans to the service line. The junior-to-be reeled off five aces during a 12-0 run that put the Aggies ahead, 22-17. Texas, which outhit A&M .308 to .125 in the set, got a kill to end the run, but A&M outside hitter Samantha Sanders countered with a sharp cross-court kill to put A&M up, 23-18. Aggie setter Camille Conner then put down an errant Texas overpass for a kill to put the Aggies at set point, and Hans then capped the 25-18 win with a kill to even the match at a set apiece. A&M took its only lead of the third set, 5-4, on an ace by Houser, but the Longhorns regained the lead at 8-7 and continued to pull away. Texas, which outhit A&M, .227 to .024, later used an 11-4 run to build its largest lead, 22-13. Hans tooled the block for a kill and Sanders followed with a kill to put A&M within 22-15, but back-to-back miscues by the Aggies put the Longhorns at set point. Texas hit wide on the ensuing play, but A&M then served into the net to end the set. There were 10 ties and seven lead changes in the fourth set. Hans' powerful serve propelled a 7-0 run that put the Aggies up, 10-6, but Texas would later regain the lead, 17-16. Freshman lefty setter Kaitlyn Rogers knotted the score, getting a kill on a second-ball attack, and a Texas hitting error put A&M back in the lead, 18-17. Texas' Micaya White got a kill from the back row, and the Longhorns then retook the lead, 19-18, on a solo block. Texas committed its 19th service error of the match, and A&M went up 20-19 after Texas hit into the net to end the longest rally of the night. The teams exchanged point for point until Texas got back-to-back kills, including a dig that fell in untouched, to go up 22-21. A&M tied the score at 22- and 23-all before Texas posted back-to-back kills to close out the match. Texas, which was led by White's 10 kills, outhit A&M, .301 to .075, for the match. The Longhorns also outblocked the Aggies, 10-2, while A&M led in aces, 10-4. Twelve of 13 available players saw action for the Aggies, including freshman middle blocker London Austin-Roark who started the match along with Sanders, Hans, Conner, middle blocker Makena Patterson and opposite hitter Maddie Douglas.